Denver, CO – The M.A.X. Pass keeps growing. New for the 2017-2018 ski and snowboard season, The M.A.X. 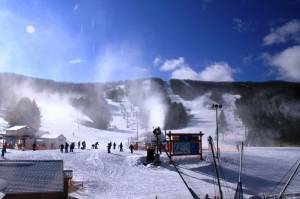 Pass now includes access to 44 resorts in North America on a single multi-mountain pass by adding six new ski resorts next winter: Windham, Belleayre, Gore and Whiteface Mountains in New York, Lutsen in Minnesota and Granite Peak in Wisconsin. Now available for $629, this lowest rate is only offered through May 1. The “Multi-Alpine Experience” Pass is the largest multi-mountain pass available for skiers and riders in North America and includes five days at each of the 44 participating resorts with no blackout dates, providing the flexibility to ski where they want and when they want. From day trips and ski weekends close to home, to vacations at destination resorts like Steamboat, Big Sky, Copper Mountain, Winter Park and more, the M.A.X. Pass gives winter sports enthusiasts the ability to travel and plan vacations to mountains they’ve never experienced before. The M.A.X. Pass is on sale now at theMAXpass.com. Skiers and snowboarders can put down $49 now to lock in the lowest prices of the season of $629 for an adult pass, $429 for teens (ages 13–17), $329 for kids (ages 6-12), and $29 for children (5 and under) and pay off the balance in mid-September 2017. Prices are good through May 1. Skiers who have purchased a qualifying season pass at their favorite participating resort are eligible to purchase the M.A.X. Pass Add-on for $329 for adults, $279 for teens (ages 13–17), $229 for kids (ages 6-12), and $29 for children (5 and under). The M.A.X. Pass Add-on provides five days of skiing or riding at each participating resort on the M.A.X. Pass, except those accessible with the qualifying season pass.